Even the heavy rain couldn’t dampen Delhites’ fashion spirits, who came in large numbers to witness the opening of BMW India Bridal Fashion Week on Friday. 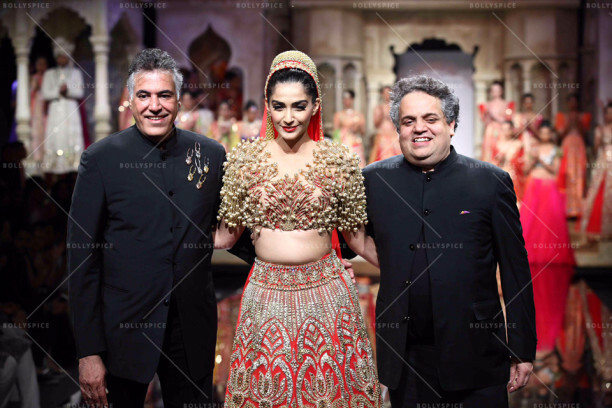 The prestigious fashion week commenced with designer duo Abu Jani-Sandeep Khosla’s show and fashion maven Sonam Kapoor turned showstopper for them. The fashionista inaugurated the show in their Black Lotus Pond gown, black net with a riot of golden 3D lotuses, fit for the Oscars. With her hair in a glamorous bouffant ponytail and a siren red mouth, Sonam was positively hypnotic. The designers paid homage to Varanasi through their latest collection and they transported the audiences to the ancient city by recreating the famous ghats of Kashi. Like the city, their creations too were timeless, mystical and a perfect combination of contemporary and traditional. The collection was designed to showcase the rich legacy of silks, brocades, gold and silver thread work and carpet weaving that the city is renowned for. Their show came to a conclusion as Sonam sashayed on the ramp wearing a magnificent red bridal lehenga. 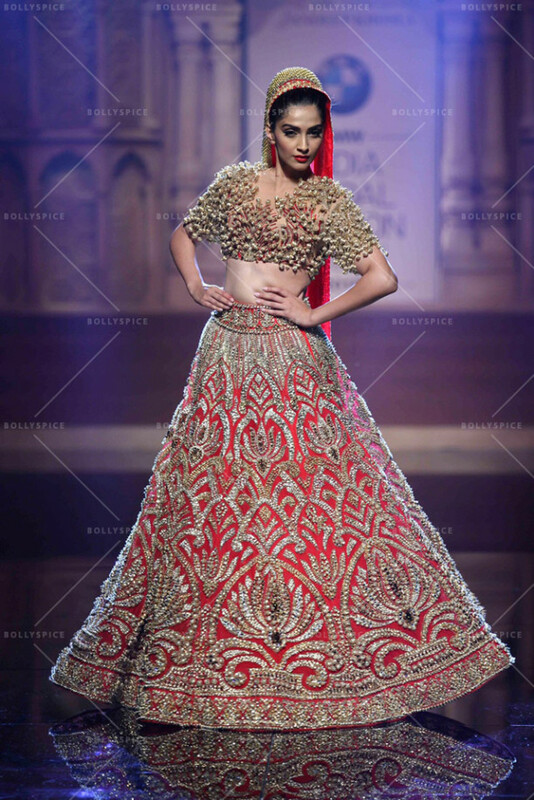 The heavily embroidered skirt and the jewel encrusted choli that the diva was wearing will be any Indian bride’s dream come true. She skipped all jewellery to let her majestic AJSK garment do the talking and covered her head with a bordered dupatta. 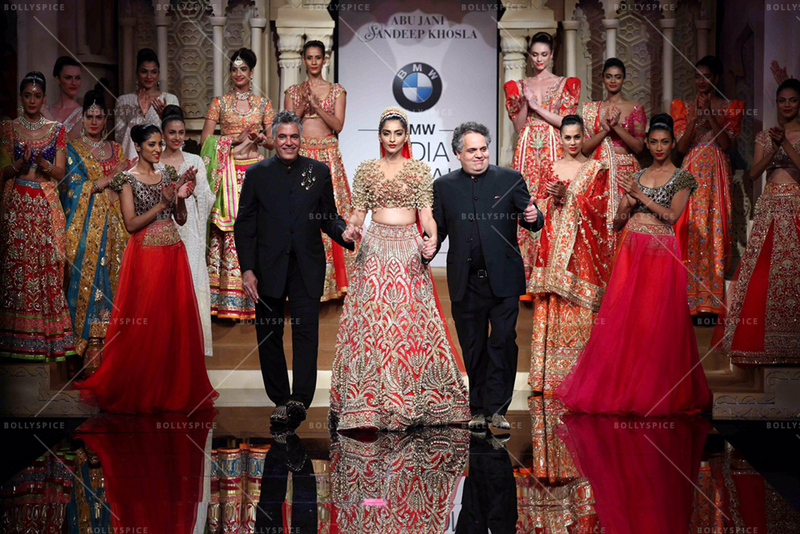 When she walked on the ramp flanked by the designers, the whole auditorium echoed with thunderous applause. Sonam, who is widely considered to be India’s quintessential fashionista, also wore Abu Jani-Sandeep Khosla at The Cannes Film Festival, this year. 15 queries in 0.324 seconds.